March 2012 Archives - Newman Dignan & Sheerar, Inc. - Providence Fee-Based Financial Advisors March 2012 Archives - Newman Dignan & Sheerar, Inc.
We have a number of reports this week to look forward to that will provide insight on the health of our domestic economy. First to bat are two housing reports-home sales and home prices. We expect them to be sluggish much like they have been for five years. Then we have two consumer confidence reports on Tuesday and then Friday. They should confirm gradually improving sentiment here at home. Then we have two major reports Wednesday on durable goods. These are highly volatile numbers because of variations in airplane orders. Without plane orders the report should be positive. 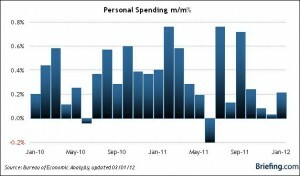 Friday we learn the monthly report on personal income and spending. Income growth has been modest and could pick up this month, as we expect spending to be strong (see chart below). One of the all-time best economic indicators is stock market behavior. With the Dow up 125 points as we write, a continuation of better economic data seems likely. One of the great mysteries to us is the relatively quiescent behavior of the monthly inflation reports. They have been running at an annual rate of 2-2 ½ percent. We recently received an e-mail comparing January 2009 and today’s prices. Here are some of the percentage changes- gasoline up 84%, corn up 78%, soybeans up 42%, raw sugar cane up 165%. Yet the real median income is down 0.7% and the number of long-term unemployed and those on food stamps has skyrocketed. So far Mr. Bernanke and the Fed seem comfortable with the current situation. We must stay alert for any signal changes by the Fed that they are more concerned with inflation and less so with the slow job growth we have seen in this recovery. Stay tuned. Solid U.S. economic data and results of the Fed’s bank stress tests pushed the markets to new yearly highs. For the week, both the Dow Jones Industrial Average and the S&P 500 moved higher by just over 2%. For the year-to-date period, the Dow is ahead 8.3% while the S&P is higher by 11.7%. Oil was slightly lower last week by 0.34% to close at $107.06 per barrel while gold dropped 3.24% to close at $1,655.50 per troy ounce. Bonds sold-off last week as the 10-year Treasury yield hit a five month high of 2.30%. Banks rallied over 5% last week after the Fed released results from their stress tests on the 19 largest banks in the U.S. Most banks fared well, and the markets cheered the news along with increased (or reinstated) dividends and share buybacks. Of course, a steepening yield curve will help banks as well. Below is a chart of XLF, a financial sector focused exchange traded fund which is up ~ 20% year to date. Manufacturing news last week was quite positive as both the Empire State and Philly Fed surveys showed better results along with January’s industrial production. News on the inflation front was fairly tame as the Producer Price Index and the Consumer Price Index were marginally better-than-expected (seems strange given the rising costs at the pump and the grocery store, but the numbers don’t lie – do they?). The news out of Europe was better, but we suspect that the next shoe will drop over the next few months. Economic growth in Portugal, Italy, Greece and Spain remains quite constrained. Debt servicing will, no doubt, choke-off growth and keep unemployment rates uncomfortably high. Of course, geopolitical tensions in Iran and Syria will continue to add to investor nervousness. We suspect that the markets have gone up too much and that a respite is in order; however, momentum remains positive. We do not intend to fight the Fed, but we remain vigilant for a directional change in short-term momentum. Last week stock markets were mixed again with the DJIA declining -0.43% and the S&P 500 up 0.9%. The big news items last week were the U.S. jobs report for February and the Greek debt restructuring. February was the third straight month with over 200,000 jobs created with 227,000 new jobs created. The unemployment rate held steady at 8.37%. This is further evidence that the U.S. economy is still on a gradual recovery path. This week look for the Consumer Price Index number on Friday, estimated to be up 0.4%, as the result of higher gasoline prices. If gasoline prices rise to $4 per gallon and stay at that level for a significant time period it would be a drag on the economic recovery. The chart below shows the national average for gas prices over the last 3 months. Greece successfully completed its debt restructuring which should buy the European Union time to address debt issues in Spain and Portugal. However, it is probably only a matter of time until contagion spreads to these countries. US stocks were mixed last week as the S&P 500 posted a 0.3% gain and the Russell 2000 (smaller companies) posted a -3% loss. Oil posted a loss for the week at -2.4%. GDP for the 4th quarter of 2011 was revised higher from 2.8% to 3% mostly due to inventory growth. Motor vehicle sales continue to recover and spending remains constrained at the state and local government level. Personal income growth slowed from 0.5% in December to 0.3% in January. Meanwhile consumer spending increased from no change in December to 0.2% in January. How can spending increase while incomes are moderating? The answer is consumers are sacrificing their savings to satisfy their spending. 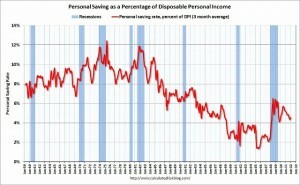 The personal savings rate peaked during the last recession and has been declining since to January’s rate of 4.6%. Consumers are also beginning to feel more comfortable about debt. This week we will get an update on January’s consumer credit outstanding. The chart below shows that revolving debt (such as credit cards) and non-revolving debt (such as auto loans) are on the upswing. Low and falling savings and growing debt are providing a short term boost to US GDP growth but will be a drag longer term. The last few months have shown improving trends for US employment. Rising employment is necessary to keep the consumer alive. We’ll keep our eye on this Friday’s Employment Situation update.